A friend of mine recently had her second baby, and Isabella and I went over to her house to visit. While Isabella and her daughter played, my friend showed me her son's nursery. It was adorable. Jungle animals on the wall. Books in a beautifully painted bookshelf. Window valances that coordinated to the crib bedding that coordinated to the rug that coordinated to the lamp shade. I immediately thought of the twins' nursery, where we made just slightly more effort than creating cribs out of dresser drawers lined with shelf paper. And I felt...guilty. Partly for financial reasons, partly because we were still in denial about the fact that we would indeed be bringing home two babies following delivery, and partly because said delivery was early, unexpected, and an emergency, we did next to nothing with the twins' room. And here's what the twins came home to. Granted, they slept in our room for the first four months of their lives. 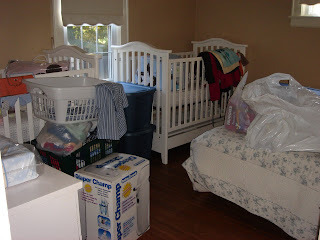 Their cribs are now set up with bedding, and I thought it was a good idea to remove the piles of clothes and plastic bags from their mattresses before they slept on them overnight, but other than that, the room essentially looks the same. There is nothing on the wall for Visual! Stimulation! There is no rug on the floor, which is very, very bad because insomniac twins + old house creaky floorboards = sleepus interruptus. The hubs just removed the full-size bed that was in the room when it was a guest room this past weekend. And there are no books, stuffed animals, or anything else (other than the cribs and the changing table, which is actually a 30-year-old dresser that belonged to my grandma, identifying the room as belonging to two babies. But it's more than a sub-par nursery that brings on the bad mommy guilt where the twins are concerned. I spent so much one-on-one time with Isabella when she was a baby. Even thought I was working from home FT, I spent hours playing with her, reading with her, taking her to the library for storytime, taking her shopping to introduce her to lights, people, and the thrill of retail therapy. We went for long walks (before she began hating the stroller), we visited friends' houses. We interacted with the world. Luci and Nicholas are getting none of this. I'm so overwhelmed with caring for the basic needs of three small kids that I have very little time left over to feed their brains, and I should be doing all I can to help them along, given their prematurity and possible developmental delays. I wonder if they'll be as verbal as Isabella is if I'm not able to spend the time I did with her with them. Do second (and third, and fourth) children always get the shaft from their parents, or is this a multiples-following-singleton thing? And please tell me Luci and Nicholas won't spend hours on a therapist's couch as adults attributing their life's problems to a mother who left their growth and development up to their two-year-old sister and three geriatric cats. Can you email me (link on my blog for address) a picture of their bedding and Isabella's? I hand paint wall decorations and would love to paint them something when I get some time. Of course second/third/fourth kids get the shaft. EVERY MOTHER I KNOW is guilt ridden about the time they *don't* spend with the second and subsequent kids. Don't worry though, because when the eldest one is off at college, the youngest one gets all the time (when they're a teenager and need it most in my opinion) for a couple of years before they head out too, making *that* transition easier for them. Don't sweat this stuff, really it's the small stuff. Funny enough, though, my *first* kid had the 'crib in the corner' but still a guest room thing going on, and it's my second one, that got the better room right from his arrival. But in terms of the 'time spent' with them it's the same as you - you make more effort purely because you can (with the first one). Now with my second one, I realise that the fact that I care, love, feed him is the important stuff, and all the stimulation etc stuff will come later. Remember that Isabella is stimulating them in a way that SHE never had as an 'only' child. That goes a long way in the grand scheme of things. I feel you here. Alan sleeps in our room (still) at 8 months and may not get his own room until he moves. I feel that guilt, too. But second children do manage to thrive somehow, so my guess is that all the attention we lavished on our firsts (like me and you) only serve to make us neurotic Type As (or maybe that is just me). Second children often seem less repsonsible, but way more chill and fun. Even after almost 10 years of being a mom, I still feel guilty that we decided to have more than one child. I blame myself because Hannah is having trouble learning her math facts. I think to myself, she'd be brilliant if only I had more time to help her with her homework. I blame myself for all of Jacob's problems and think, if he were an only child, I might have more patience to deal with them. He might not even have any of these problems. I feel guilty that having a third child has really stretched our time and money to the limit, and I have to say 'no' to the other two when they want to take swimming lessons. I don't have time enough for anyone - not my husband, not my kids, not myself. The guilt is inevitable, Kristi, but you have to understand that you are a lot harder on yourself than anyone ever will be. You are doing a fine job, so give yourself a break. Remember, Isabella will never remember a time when she was the only child. The bond that she is forming with the twins right now is so special. I agree. To a certain extent, it's unavoidable. However, I also reached a point where I was having thoughts similar to yours and I realized that with a little more effort, I could make the out and about happen. To my surprise, it wasn't that hard, and it made the daily drudgery easier--when I've watched fussy babies, forcing myself to take them out and about; usually, not always, resulted in them being less fussy. The stimulation, I guess. Sorry, but I had to chuckle a bit when I read your worries about whether or not they'd be verbal. Julianna didn't talk until she was 2. Now you'd have to use duct tape to shut her up. I bet they'll be just fine. PS - And I meant to add that the twins wil adore Isabella as their big sister. She will give them attention in ways that you can't. Don't worry about it! They'll never know in the end unless you tell them! My girls' room is just not getting put together as well. There is so much visual stimulation in your house Kristi! They watch each other, Isabella, the boatload of toys, the doting relatives... oh my. All they need is love, shelter, and food. They don't need to have a pretty bedroom. Our one and only's bedroom has looked like a storage room since day 1, and he LOVES his room. I think only the parents care about that stuff -- I'm usually a wee bit embarrassed when he takes someone up to show his room. But he couldn't care less! I think it's normal for parents to feel like their shafting their subsequent kids. Part of it is the obsession with doing things -just right- with the first one, and then later realizing that a loved kid is going to generally turn out okay, regardless. Part of it is the nature of time and money as a family grows. I am the oldest of three, with a brother four years younger and a brother ten years younger (yes, we all share the same two parents). Even with that spacing, I know my mother still thinks about how much time and attention my brothers didn't get from my parents when compared to me. But they had other dynamics. And both are well-spoken, high functioning men. And it terms of rooms, fret not. MrMan was in the same room with us until after his first birthday, and I don't think it has hindered him. Of course, I am biased, but still. I keep reading in all of the frugal blogs that I subscribe to that decorating nurseries is more for the parents than the babies. They won't remember or care if they had matching wall valances. And, judging from my dad and his twin brother, your twins come with a built-in attention buddy. They will know you love them and care for them. My 2nd TOTALLY got the shaft. He is 1 now, and moved into the pack n play in his brother's room 2 days before he turned 1. If we weren't moving in a month, I may have made the effort to move his crib in there, but for a month anda half, a pack n play will do, right? I don't know of any mommy who doesn't feel guilt over things that happened for the first that didn't for the 2nd. And as a (mostly) well adjusted 2nd child, I am ok with that! My twins are now two. They have caught up developmentally (born 10 weeks premature) and are happy, fun, and independent children. Plus the best part about twins - built in playmate! I'm sure you hear that a lot, but in a few short months you will be seeing the fruits of your labor pay off. Hang in there! Heck my son (my 3rd) does not even have a room or a proper cot. He sleeps in the living room (beside the dinner table) in a travel cot . During the day he sleeps in his sisters cot with lovely pink covers. We tried to do up Meredith's room, and I think that we did a good job with it ~ but as far as one-on-one time and stimulation, it's *very* difficult. I enjoy getting to spend time with *just* Lucas or *just* Meredith because that doesn't always happen these days. I remember showing Lucas our laundry when he was a baby and saying, "Red T-shirt! Blue shorts!" ~ but I don't do that with Meri. Heck, I can barely fold the laundry with both kids around !LOL! :) I *so* know what you mean. I think I got the shaft because I had a little sister! Maybe she didn't get all the attention I did when she was born, but she got her fair share. It evened out for us -- my parents were very keen on making sure things balanced out, one way or another. I think the benefits that the younger children get far outweigh the negatives. Isabella may have gotten undivided attention, but she may also end up being a pleaser who NEEDS attention. The twins may not have all new stuff to call their own, but they will have a much larger selection of toys because of hand me downs. The twins will learn to share at a MUCH younger age than Isabella ever had to. The twins will benefit from having parents who are not as concerned with the little things. When you have more than 1 child, you cannot fret over stains, spills, broken crayons, etc. as much as you were able to with only 1. My kids are enjoying a whole lot more freedom now than Justin ever did when I had all the time in the world. I don't think Luci and Nicholas know any different. But I know what you mean -- with baby #2 coming, I wonder how I'm going to split my time between the two.